This has been the year for finishing projects! I already mentioned in a previous post how I finished my fireplace project back in April. 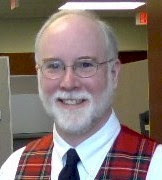 What I didn't mention was that I started that project back in 1999. That was to be our Y2K heat source. That means it took me about 8 years to finish that fireplace. That's not too good. I won't go into all the different times I built that wall surround myself, and ended up having to tear it down because the angles were wrong, and how I finally had a carpenter friend of mine come this year to finish the wall: redoing the framing and drywall. I did build the oak surround with some pre-built parts and do the staining and finish. Although I'm not too proud about it taking me 8 years, I sure am glad it's done! By God's grace, I am getting better at projects. We just finished another major project: our front walkway. And this one took only a couple months and involved the whole family! We were able to get about 2-1/2 pallets of pavers for free from a Landscape Supply that was going out of business. I started out by doing a dry run on the driveway. This enabled me to do all my measurings so I would know how the walkway would turn out. We sure got a lot of comments from our neighbors about how they'd never seen anyone build a walkway in the middle of their driveway before! The hard part was the excavation. 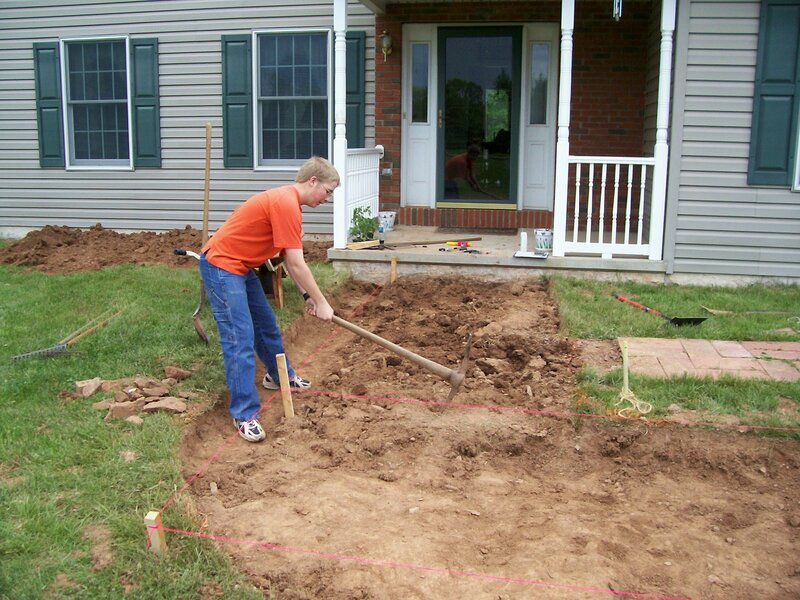 We had to dig down about 8 inches to give us enough room for the foundation, sand, and pavers. 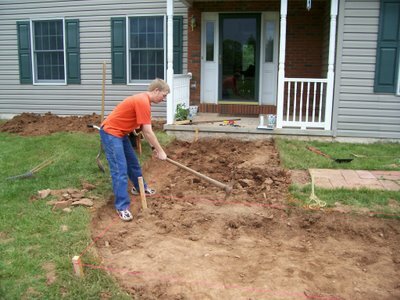 We also had to dig about 16 inches wider than the finished walkway. I took a couple days off work, and expected this to take about three days total. It turned out to be a larger job than we anticipated. The excavation didn't have to be exactly level, but we did need to be sure we were at least 8 inches down. I strung bright orange string at the height and pitch of the finished walk and was able to measure down from that. 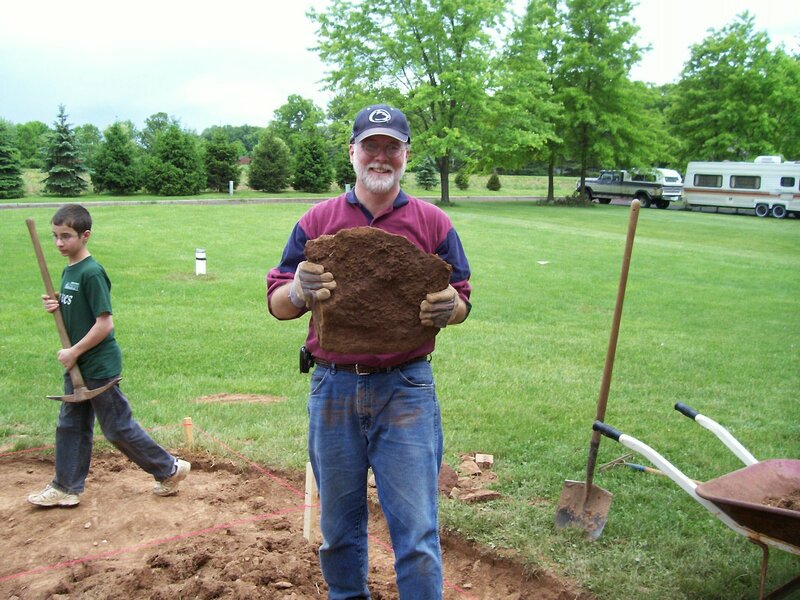 The excavation took longer than expected because of all the rocks we found. After laying separation fabric down, we then laid our foundation of at least 4 inches of modified gravel. This is the part that had to be as good as we wanted our finished walk. This foundation layer had to be the exact pitch and smoothness as we wanted the walk, and exactly 3-1/2 inches below where we wanted the finished walk to be. When everything looked perfect, we rented a vibrating plate compactor and compacted everything into a solid foundation. By using a notched 2x4, I was then able to spread out an inch layer of course sand. Then the careful laying of the pavers. This is the part of the project that finally lets you see some hint of the finished work. It wasn't quite as easy as I thought it was going to be to get all the pieces to fit together just right. I ended up re-doing this first two feet a second time. It was surprising how your forearm muscles feel the strain of picking up and laying down hundreds of these pavers. After all the pavers were laid, I rented another vibrating plate compactor, this one with a rubber mat so as not to scuff the pavers. 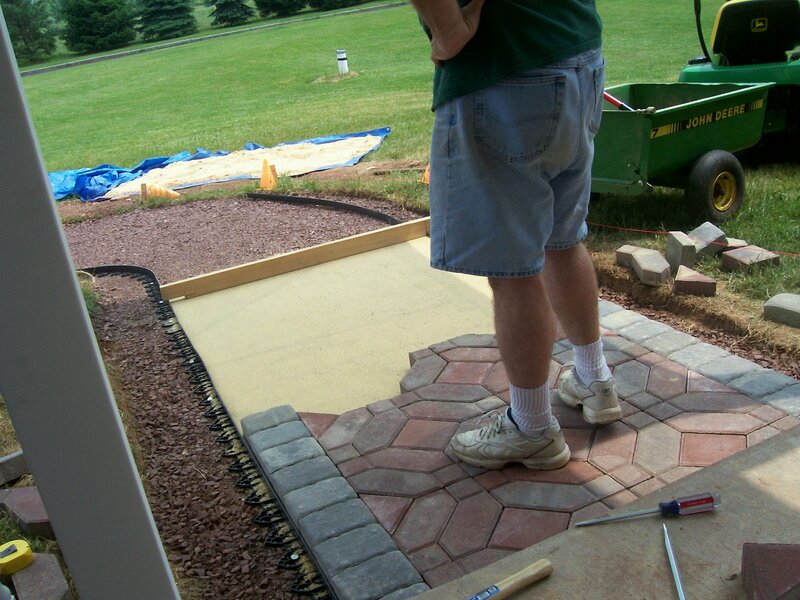 This step helped to seat the pavers into the bed of sand. Once everything was in place, we had to brush sand into all the spaces between the pavers which serves to lock them into place. The best part of the project. The satisfaction of seeing the finished job. Now we we just have to invite some friends over to use our new walk! What's my next project? 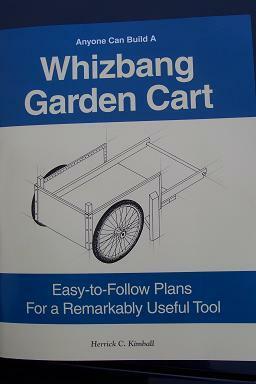 I just got my new copy of Herrick Kimball's book, Anyone Can Build a Whizbang Garden Cart., in the mail. I am looking forward to working on this with my two boys, and I'm hoping that it will be a lot easier and quicker than the walkway. Stay tuned for future updates on our Whizbang Garden Cart project. We will probably get started after I order my wheels. Although I didn't mention it in the main post, I need to say how grateful I am to all my friends that helped with the walkway! 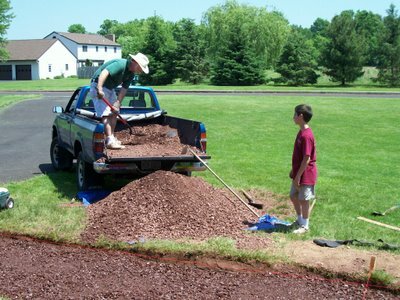 I'm cautious about posting pictures of others on my blog, so I left out the pictures of my neighbors that lent me extra shovels and even helped with the digging. The day we actually laid the pavers, a good friend and 2 of his sons spent most of their Saturday helping out. It was good working together with another father and sons. We couldn't have done it without them. Thanks guys! That's a real nice looking walkway! 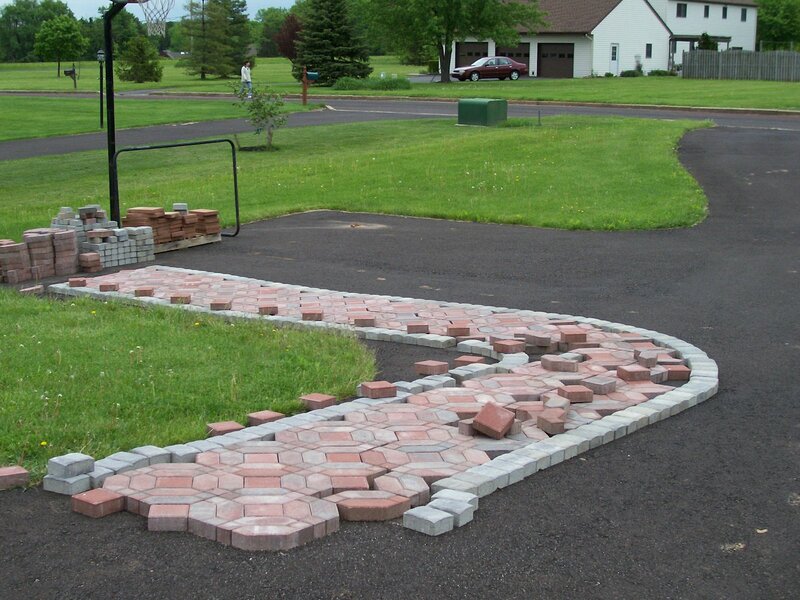 I have similar plans for a patio and walkway using paver brick. You have inspired me. That is absolutely beautiful! It scares me to think of doing that here, though. I just know I wouldn't be able to do it right. 8-( Good job.